Since QuarkChain’s Guardian Plan was announced, it has attracted extensive attention from the global community. After constant development and test, we are proud to announce that staking QKC for votes is officially open! 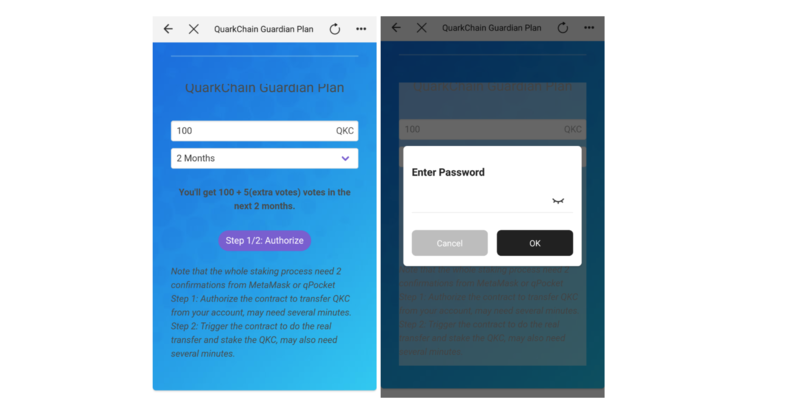 From now on, users are allowed to stake QKC for receiving votes at the Guardian Plan page and earn the early bird rewards before QuarkChain mainnet launch. The Elf Guardian campaign will officially start in early April, 2019. All QKC holders are elegible to stake QKC for votes on the Guardian Plan pages to participate in voting for the Elf Guardians. Those that show long-term commitment by staking for a longer duration will be rewarded with extra “bonus votes”. To encourage this staking for votes process, early birds will receive extra votes. Users who stake for votes on March 20 will receive extra 4% votes, which will be reduced by 0.1% every day until the mainnet launch on April 30. How to stake QKC for votes? Download and install qPocket at: https://www.qpocket.io/Note: Staking for votes in qPocket only support iOS11 and newer versions (for iOS users). Do NOT use the exchange address to stake QKC. 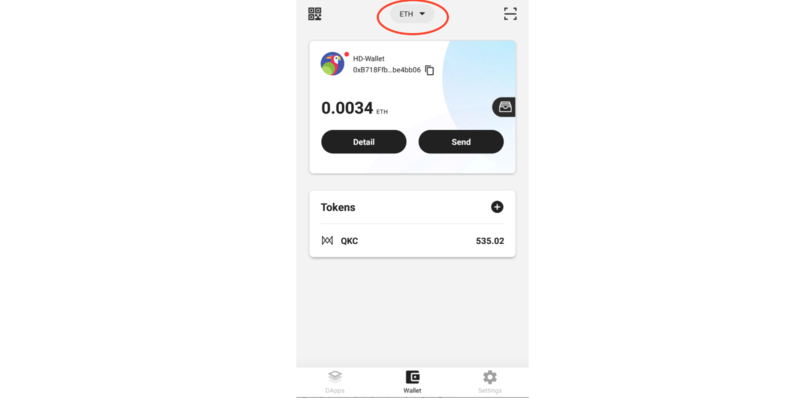 Please transfer your QKC deposited in the exchange to qPocket or Metamask to finish the staking process. Please reserve a small amount of ETH to pay for Gas fee to avoid transaction failure. (1) Open qPocket at your phone. => Create or import a wallet.=>Switch to the “ETH” network. 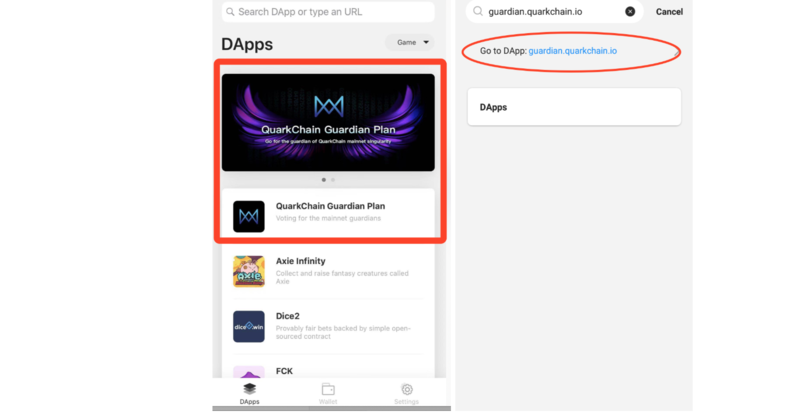 (2) Click “Dapps” button and search for https://guardian.quarkchain.io/ at the top search bar. (3) Fill in the amount of staked QKC and staking duration on the event page and click “Step 1/2” button. Input the transaction password on the pop-up page. (4) The staking process requires double confirmation. Thus, the users need to input the password twice. Notice: The confirmation time of transactions might be long due to the network congestion. If the operations are still in progress according to the page prompt, please wait with more patience. Do not quit or refresh the page to repeat the operation, which might take longer time. (5) After some processing time, there will be a dialog popup when the staking process completes. Please make sure to use the address with full ownership to participate in staking for votes. Do NOT use the exchange address to stake QKC; otherwise, staked QKC cannot return to your correct wallet address after unstaking. Please transfer your QKC deposited in the exchange to qPocket or Metamask to finish the staking process. Elf Guardians will be re-elected every two months. Votes will be cleared when a new term starts, and all voters need to re-vote accordingly. Voters who miss the voting will be deemed as not participating in this round, and thus they are not eligible to receive rebate rewards from Elf Guardians and other rewards in this round. Please notice that one can not participate in the next round of voting if his/her staking duration expires. ONLY participate in the event at https://guardian.quarkchain.io/. Please do not send your QKC to any private wallet address and be careful of fraud. QuarkChain does not assume any responsibility from that. QuarkChain Mainnet 1.0 supports sharding blockchains and a root blockchain. PoSW, an innovative consensus algorithm exclusively developed by QuarkChain, combines the two main features of PoW and PoS, incentivizing miners by staking. The higher percentage of all hash power of the network, the more stakes will be needed to mine. At the early stage of Mainnet 1.0, to protect the root chain from hash power attach, a simplified version of PoSW will be applied, i.e., the Guardian Plan, which is launched to protect all community members’ interest and guarantee the security of Mainnet with enough hash power. Mining rewards will be distributed to all participants at the same time. Members who participate in the Guardian Plan are expected to receive a minimum of 30% and a maximum of more than 300% annualized returns. Besides, the rewards of the Elf Guardians for Term I will be doubled! Previous QuarkChain Guardian Plan Official Release! Participate in the Campaign to Win the Benefits!